Tired of broken glassware? Pick up some unbreakable acrylic or polycarbonate drinking glasses, and never replace them again! If you're constantly finding yourself cleaning up broken glass, whether it's because of guests, kids, or your own clumsiness, there is finally a way out of the mess once and for all. Unbreakable acrylic and polycarbonate drinking glasses provide tough, long-lasting glassware that won't shatter into a million pieces. They look just like regular glass, and come in all sorts of shapes and sizes, from tumblers to wine glasses, highballs, martini or margarita glasses, beer mugs and more. Pick some up today and never worry about cleaning up carpets full of broken glass shards ever again! How can glasses be unbreakable? It's surprising this hasn't caught on yet, since indestructible plastic bottles are so readily available and enduringly popular. 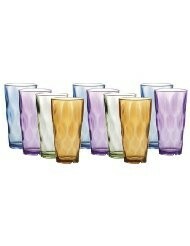 Why not do the same with ordinary drinking glasses? By using shatter-proof and impact-resistant materials such as acrylic or polycarbonate, glassware can be made to survive the rigors of small children, clumsy adults, tile floors and outdoor patio parties. They are virtually indestructible when subjected to everyday use, not particularly expensive, available in clear or colorful finishes, and will probably outlast the dinner table they adorn, and can be handed off to future generations. You'll never have to clean up a floor full of tiny glass shards ever again, and you certainly won't have to "find" them weeks later with your toes. Most unbreakable glassware is made from polycarbonate, which is the stronger of the two, though acrylic glasses are still tougher than ordinary glass. Both are dishwasher safe, though generally only suitable for the top rack, on medium heat cycles; higher temperatures can damage the material, so keep the dishwasher on a regular cycle if you use one. These materials are safe when used properly, and have been used in plastic water bottles for decades without any trouble. As long as they're properly handled, they won't cause any problems. In some cases they are even microwave safe, but make sure to check the care instructions before throwing them into the microwave to see what happens. 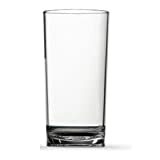 The highball glass is a worldwide classic, found in households and restaurants all over the world, with a slim elegance that is at home in any style of decor. When made of durable acrylic or polycarbonate, they become even better. Below are some of the best polycarbonate and acrylic glasses available online, all of which are made from impact-resistant materials, and will survive all sorts of drops, toasts, and other punishment. They're entirely dishwasher safe, and will probably pay for themselves after enough dinner parties. Maybe just a few, if they're birthday parties for 5 year olds. Some brands make a variety of shapes and styles (Clarus Tritan in particular), so you can outfit a whole kitchen with matching glassware, from highballs to rocks glasses, for all sorts of different needs, and have a fully stocked bar, ready for anything. Despite their history of being the glass of choice for strong drinks such as whiskey straight up or on the rocks, plus all sorts of mixed drinks, lowball glasses are responsible for far fewer spilling mishaps than their taller counterparts above, and are actually great for children. They're shorter, harder to knock over, have less liquid in them to begin with, and will keep things a lot cleaner as a result. Plus, they look classy. Fewer companies manufacture lowball glasses compared to the taller styles, so there aren't as many options here, but you can still find high-quality acrylic or polycarbonate tumblers in lowball style that will hold up to whatever you throw at them. Again, all options listed are dishwasher safe, though in most cases top-rack only, and not on cycles using high heat for drying purposes. So of all possible applications of unbreakable acrylic glassware, wine glasses are clearly the best possible use of such technology. Wine glasses are exceedingly fragile, and wine makes people increasingly likely to drop fragile things. Plus, they rattle together in the dishwasher, and usually come out upside down when everything has finished. Time for a change. The wine glasses listed below are manufactured from highly impact-resistant material, which will be happy to bounce off a tile floor and be used again and again. It won't solve the problem of wine stains, of course, but at least you'll only have to clean up one mess instead of two. The options listed below are some of the most popular or highly regarded options. Some are sold individually, some in sets, so check out the options. All are dishwasher safe, and will last for many years. So apparently this is a new thing sweeping the nation, as millions of happy wine enthusiasts realized that the stem was an elegant but useless appendage that makes dishwashing far more of an awkward hassle than it has any right to be. Enter the stemless wine glass, which looks an awful lot like a curvaceous lowball tumbler, and is probably suitable for use with all sorts of drinks. It's also harder to knock over when it's half the height, and much easier to wash, store and transport as well. We shall see if efficiency wins out over aesthetics, though many people are happy to have these adorable glasses in their household, and throw classy wine parties with them. And now they're unbreakable too! What do you think of unbreakable drinking glasses? They're awesome. I break things all the time. I'm not a clumsy weirdo. Glass for me. For a fully stocked bar, you'll need glassware of all shapes and sizes, and luckily there are plenty of options in these categories, from margarita glasses to classic martini glasses, champagne flutes, beer mugs and more. While the market doesn't proliferate with dozens of manufacturers all making plenty of models, you won't have any trouble finding high-quality, shatter-resistant glassware for whatever your needs may be, whether it's a private dinner party or a major event, with all sorts of glassware available for cocktails that require that extra touch of tradition or authenticity. There's nothing classier than a fully-stocked bar with one of absolutely every sort of glass, ready to prepare absolutely any drink that gets requested. Be sure to collect them all! Holds 16 oz. comfortably; 18 oz. to the brim. Clearly Acrylic did not establish the fake "list" price! For a touch of color, whether it's to match a set of dishes, or simply to add a little flair to the dinner table, there are some good options featuring the same shatter-proof materials used to construct the unbreakable glassware displayed above. Plenty of these are pretty cheap, too, particularly the CreativeWare sets. Without spending a whole lot of money you'll be able to outfit a whole kitchen set relatively inexpensively, and never have to worry about it ever again. These are some of the best options out there, highly praised by many satisfied buyers, but for more choices, whether color or brand, click on the products below to see what's available at Amazon. Tired of filling and popping ice trays again and again? Pick up some reusable ice cubes for drinks in time for your next party! The Glencairn Scotch whisky glass, although a fairly recent innovation, has very rapidly become synonymous with whisky drinking. What makes this glass so special?